English: Acari (or Acarina) are a taxon of arachnids that contains mites and ticks. The diversity of the Acari is extraordinary and its fossil history goes back to at least the early Devonian period. As a result, acarologists (the people who study mites and ticks) have proposed a complex set of taxonomic ranks to classify mites. In most modern treatments, the Acari is considered a subclass of Arachnida and is composed of 2-3 superorders or orders: Acariformes (or Actinotrichida), Parasitiformes (or Anactinotrichida), and Opilioacariformes; the latter is often considered a subgroup within the Parasitiformes. The monophyly of the Acari is open to debate and the relationships of the acarines to other arachnids is not at all clear. In older treatments the subgroups of the Acarina were placed at order rank, but as their own subdivisions have become better-understood it is more usual to treat them at superorder rank. Most acarines are minute to small (e.g. 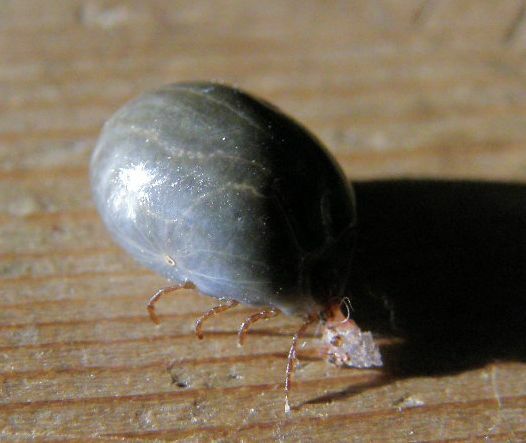 0.08–1.00 millimetre or 0.0031–0.039 inch), but the largest Acari (some ticks and red velvet mites) may reach lengths of 10–20 millimetres (0.39–0.79 in). It is estimated that over 50,000 species have been described (as of 1999) and that a million or more species are currently living. The study of mites and ticks is called acarology (from Greek ἀκάρι, akari, a type of mite; and -λογία, -logia), and the leading scientific journals for acarology include Acarologia, Experimental and Applied Acarology and the International Journal of Acarology.